These were laid out in 1997 after much of the old orchard originally of Ardleigh Park was cleared. Only Cotinus coggygria 'Atropurpuea' remains from the original overgrown beds. The borders are edged by timber logs all from fallen trees in the woodland. 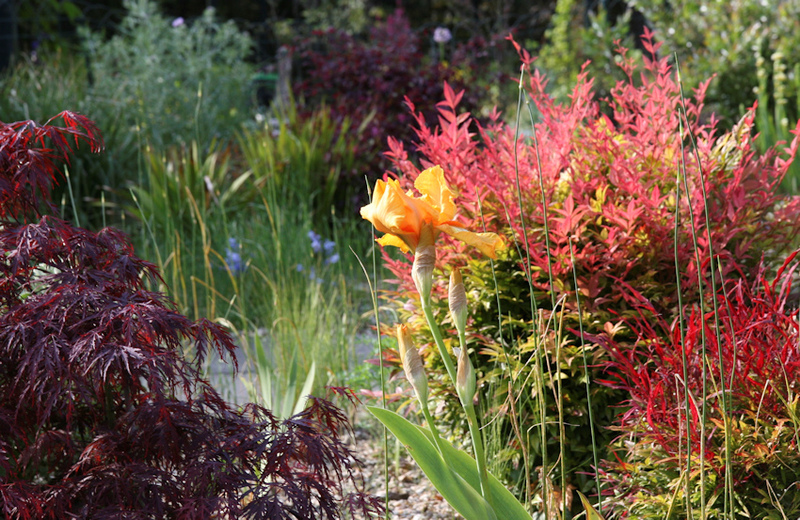 Planting is designed to give all year round interest although they really peak from late June onwards and provide colour and interest through autumn and winter. Magnolia grandiflora 'Gallisonae', Pittoporums, Chimonanthus praecox 'Lutea', Clerodendron trichotomum, Acers and Phormiums providing the structure. A Pawlonia tomentosa coppiced annually in February creates a magnificent focal point by August each year. 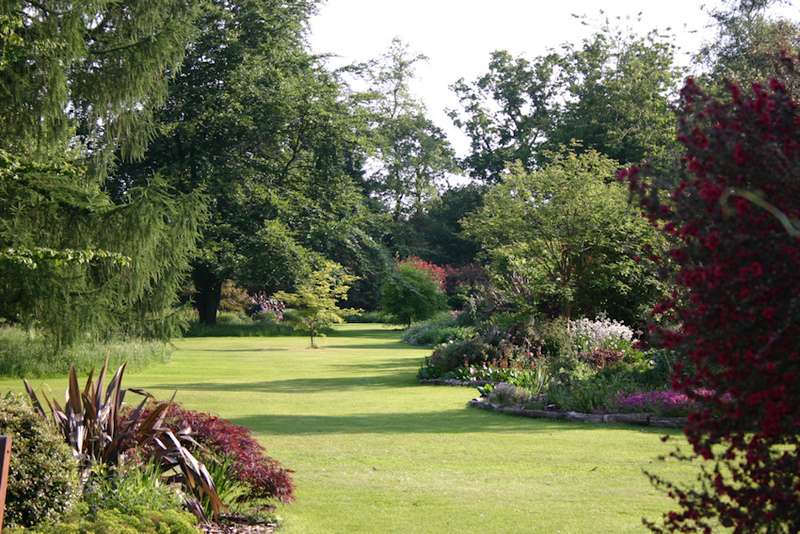 Two new borders were created in 2002 and 2004 to provide interest beyond the original borders and woodland borders. Structural planting includes Cercidiphyllum japonicum, Acers, Chimonanthus, and Sorbus sargentiana. The light native soil allows a different range of plants to thrive in these beds including Eremerus, Euphorbia mellifera, Watsonias, Penstemons and many unusual bulbs. Trellis screens enclose this area; yorkstone paving was found on site and the table and chairs were made from felled apple trees and slate found in the garden. 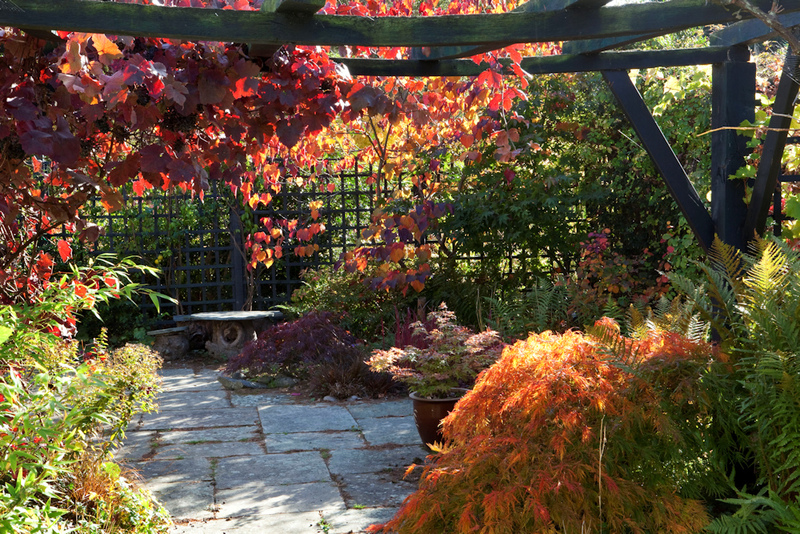 Acers, Cercis canadensis 'Forest Pansy', Leptospermums, Hostas, ferns, and several unusual climbers feature such as Akebia quinnata, Schizophragma hydrangeoides and Bignonia capriolata. Crinodendron hookeriana, Callistemon, and Ribes speciosa are trained as wall shrubs. 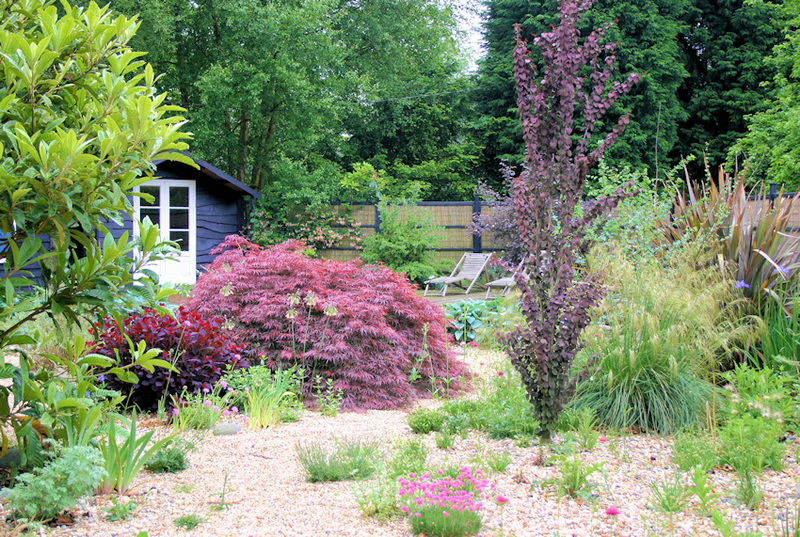 Constructed in 2002, this garden was designed with low maintenance in mind. Willow screen panels create privacy and beach cobbles and gravel ensure minimal moisture loss and weed growth. This garden has never been irrigated. A generous decked area of railway sleepers sits at the edge of the pond which is inhabited by a wide variety of wildlife. The planting is silver and purple foliage plants, with flowers in shades of blue, mauve and pink. Alliums feature strongly along with Artemisias and some unusal shrubs often tender in this country such as Rhapiolepis, Eriobotrya, Olearia, Corokia and Leptospermum. A new gravel entrance garden opened in 2007 featuring a 'dry stream' running through it and a slate water feature. The plants used create maximum impact with strong leaf colour,shape and texture. There are many scented Daphnes, beautiful Acers and stunning bulbs such as Gladiolus tristis, Watsonias, Dierama pulcherrima and Gladiolus papilo Ruby. The area looks spectacular when lit at night. 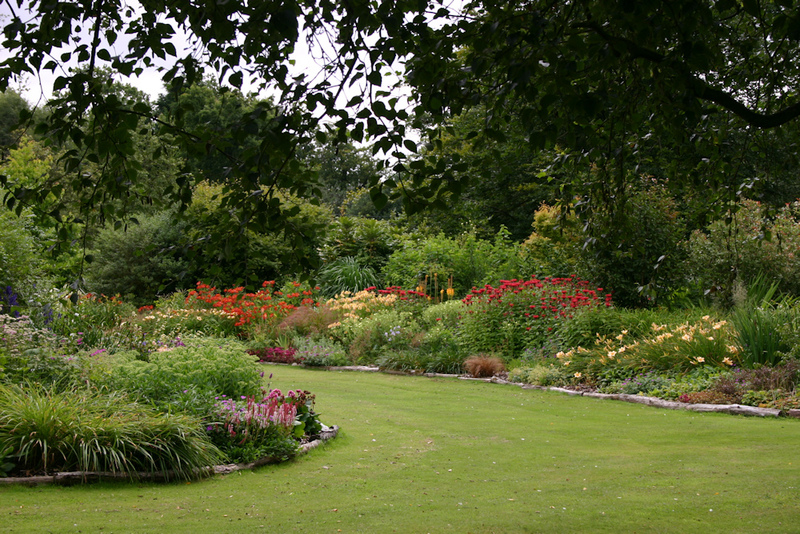 The original small gravel garden remains adjacent to the nursey area. The Leptospermum scoparium hedge makes a colourful backdrop to mixed foliage plants and grasses with contrasting colours and textures. A huge swathe of land was reclaimed from the invading sycamores and brambles in 1999. Only a few birch trees were saved, and around these were created a series of beds with woodland planting of Azaleas, Rhododendrons and Camellias. 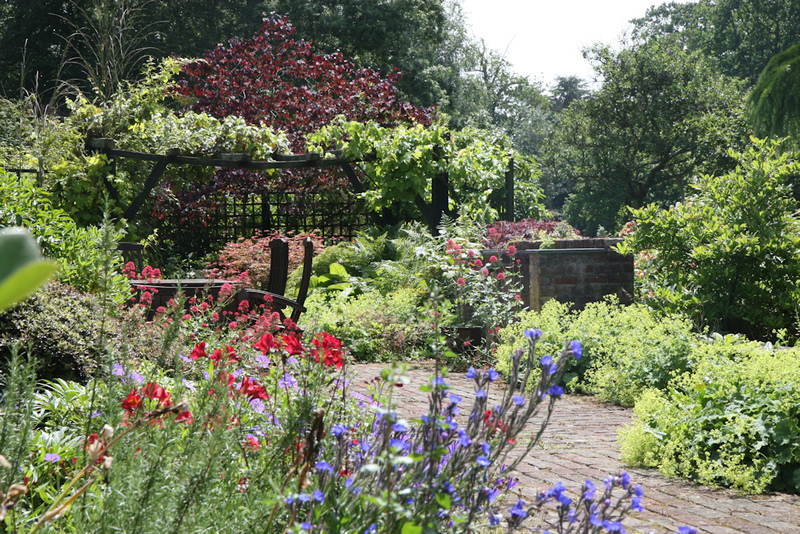 Spring flowering perennials and bulbs flourish here before the trees have their leaves. These giant lilies are over 7feet tall and take seven years to flower from seed. They are monocarpic, so they die after flowering and setting seed,leaving offsets which take 4-5 years to mature and flower. The original pond was discovered amongst overgrown scrub in 1998 and developed in 1999. It was enlarged, repuddled and streams created with decking spanning one side of the pond, constructed from fallen oaks in the woods. 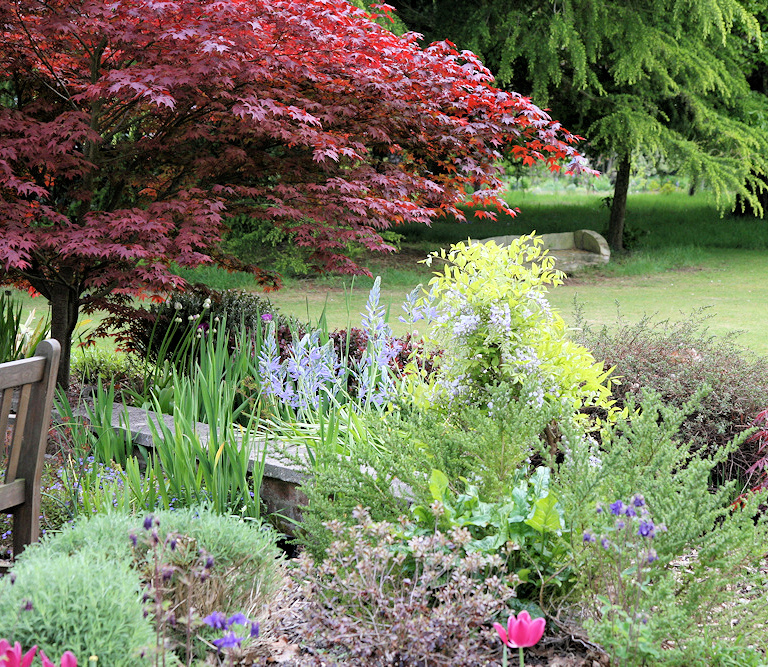 Acers ferns, Bluebells, Hostas, Epimediums, Gunnera, Embothrium, Azaleas and primulas give the area colour from April to July. In September stunning blue Gentiana septemfida contrasts with the magnificent Autumn colours of the Acers, Hamamelis, Cornus and Fothergilla. A bamboo dell leads from this area to the woodland beds. In spring 2005 an additional 4 acres were opened up to the public. Here the sycamores have been cleared and replanted with oaks, hornbeams, and many ornamental trees and shrubs such as Hamamelis, Liquidambers, Stewartias, Magnolias, and Azaleas and underplanted with unusual woodland perennials and bulbs such as Arisaemas, Trilliums, Podophyllum, Gentians, Dracunculus and the spectacular Cardiocrinum giganteum. Snowdrops carpet the ground in Jan/Feb and the bluebells in April/May must not be missed. Between 2006 and 2008 the final 7 acres of woodland were cleared of fallen trees, sycamores, and brambles. Carpets of bluebells were revealed having been hidden for decades under the brambles. Woodland walks have been created amongst the statuesque mature oak trees. Rustic buildings have been designed and constructed from timber on site. A children's jungle area, a birdwatching area with shelter, and a further pond have been created. 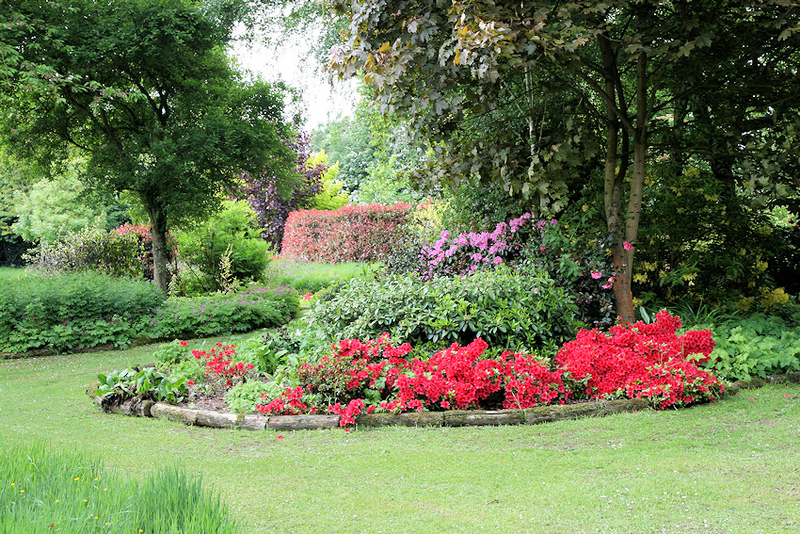 The planting in these areas include many very rare varieties of trees and shrubs, along with large areas of Acers, Azaleas, Camellias and Hamamelis, as well as hornbeams and oaks for future generations.